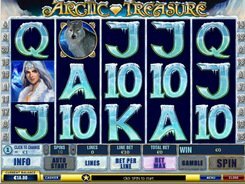 No gamer can resist the temptation of playing the stunning video slot called Arctic Treasure where you can grab really big money. 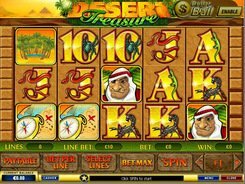 The gameplay involves 5 reels and 20 win lines. The coin value is adjustable from 1 cent to 5 dollars. 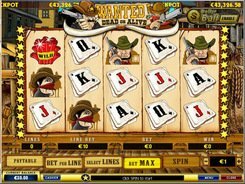 The winnings can reach 10,000 coins with a top bet of $1000. 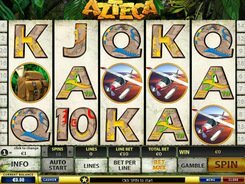 The slot symbols are devoted to the theme of adventures. Prepare to be taken to the Frozen Land and meet an owl, husky, polar bear and other residents of snowy locations. Ice Princess acts as a wild and substitutes for other symbols to complete winning combinations. Increase your prize by getting more wilds on an active line. The scatter symbol is the Eskimo. To earn 2 to 100 coins you have to get 2–5 of these Eskimo icons anywhere on the reels. 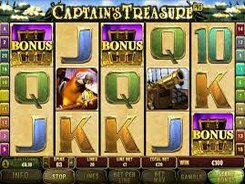 In addition, you will be awarded 10 free spins with x3 times’ multiplier once you reveal three or more Eskimos. Every player dreams of getting the Ice Crystal Bonus symbol. To trigger the bonus game, the Ice Crystal must appear simultaneously on reels 1 and 5 in any position. The bonus feature takes place at an amazing ice castle where you meet the Arctic Queen. She will reward you with three crystals containing cash prizes and bet multipliers of up to x150. PLAY FOR REAL MONEY!